Command line support, for expansion of the GUI functionality & batch conversion. To learn more, please read on, or watch the screencasts. Right after you open a file Script Encoder Plus will attempt to determine its type in 'Before' window. You can also do so manually, or correct its automatic assumption. This selection is crucial for the conversion since all of the abovementioned file types are converted differently. No Changes - will not alter the script in Before window, but may allow applying of other options. LF only (\n) - use this selection to make a Unix-compatible file. At this time many browsers understand this encoding, so choosing it will not only make the code less readable but also smaller in size. CR only (\r) - use this selection to convert all line-feeds to Carriage Return only symbols. Add Colons (for VBScript) - when checked will make Script Encoder Plus add colons at the end of lines in the VBScript script to make it appear as a solid line of code. Remove Semicolons - when checked will make Script Encoder Plus remove extra semicolons in the script that are not required for scrambling. WARNING: Always check semicolons removed automatically by Script Encoder Plus (they will be marked in Before window after conversion is done). When conversion options are set, you may now click Convert button to perform conversion. Open - opens a window that allows you to select a file for conversion. You can also open a script file by dragging its icon into Before window, or by selecting it from the File menu's recently opened section. File Encoding - allows you to specify file encoding used to save file. Save for offline viewing - option used for compatibility with IE on Windows XP SP2 and later OS. When checked saves HTML file for offline viewing. This prevents Internet Explorer from showing warning messages. Select All - selects all the text in Before or After window, depending on which one is currently selected. Move to 'Before' - copies code from After window into Before window. This option might be used for recurring conversion due to complexity of the script. Undo - undoes code changes in Before or After window. 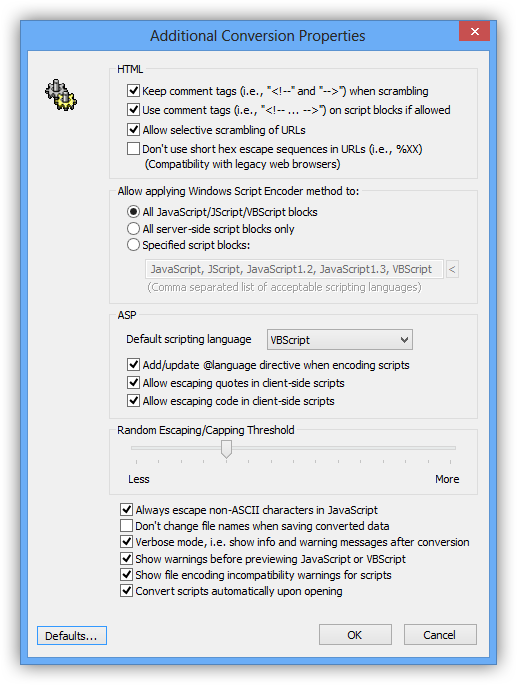 This option is multi-level, enabling you to revert to previous state of the script. Redo - rolls back changes undone by the undo option. Find - shows the window to perform text search in Before or After windows. Next Semicolon - if semicolons were added or removed from Before or After windows, this option cycles forward through them by highlighting added or removed semicolons. Previous Semicolon - if semicolons were added or removed from Before or After windows, this option cycles back through them by highlighting added or removed semicolons. Locator - translates selected code block from one window to another. This option might be useful for debugging your code: for instance, you may want to select a questionable part of the code in Before window and click this button. It will find selected code in After window. It also works the opposite way. INFORMATION: Locator should not be used for determining exact correlation between original and converted scripts - it only hints location of the selected segment. INFO: These properties have "global" scope. Use comment tags on script blocks if allowed - if checked, puts the comment tags (i.e., tags like <!-- ... -->) into the embedded script blocks. If on, will increase the code size and the readability of the script. But, these tags might be still required by older browsers to process your HTML/classic ASP document correctly. Allow selective scrambling of URLs - if checked, escaping of links in the HTML document is permitted while scrambling. Specified script blocks - will apply to specified script blocks only. Use the field below to specify which scripting languages, in a comma-separated list. This option applies to client-side and server-side scripts. Add/update @language directive when encoding scripts (ASP) - check this option if the @language directive should be updated automatically while encoding a classic ASP script using Windows Script Encoder method. Don't change file names when saving converted data - this option is provided for compatibility with the older version of the Script Encoder Plus. It is strongly recommended to keep this option unchecked. By keeping it unchecked, the Script Encoder Plus will add (scrambled) or (encoded) to the end of a file name when saving a converted script. IMPORTANT: Never write over an original file after performing an automatic conversion with the Script Encoder Plus! OK button - saves changes done to the settings in this window. Cancel button - discards changes done to the settings in this window. INFO: Double-click on this section of the status bar to place the cursor at the location reported in the error message. INFO: To change it double-click it. Unicode - encoding using two bytes per character, which allows many international characters to be saved without distortion. The downside of using this encoding is that it doubles the file size needed to store and transmit a script page. Unicode (Big-endian) - the same as Unicode but with reversed byte order. UTF-8 - encoding that employs a mix of ANSI and multi-byte characters. It may be the most effective way to save international web pages since it uses one byte encoding for English characters and multi-byte encoding for any others. Besides that Script Encoder Plus allows you to select the code page that will be used in HTML documents (for conversion) when saving data to a file. A complete list of supported code pages might be found in the corresponding box in the File Encoding & Code Page window. 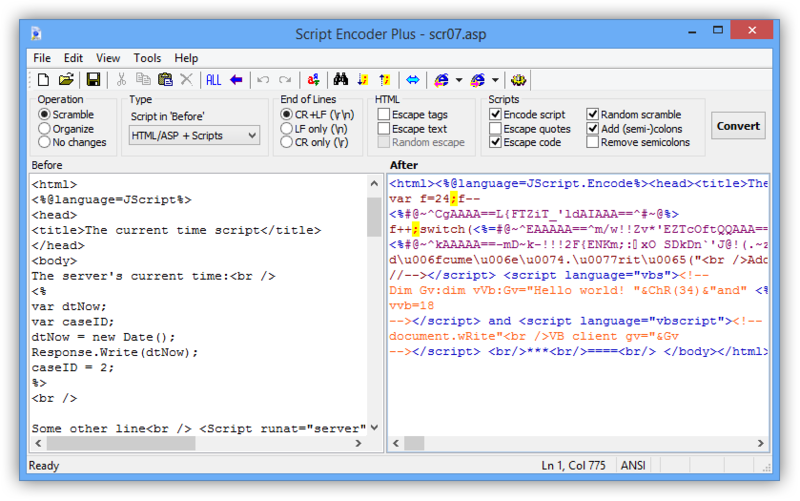 Script Encoder Plus can be run from the Windows command line without involving the visual editor. This could be useful if you prefer to run Script Encoder Plus in the background, or as a part of another software. It can perform the same tasks from a command line as those that are available in its normal (GUI) operation. For more information go to Help -> Command Line Help from the main menu in the Script Encoder Plus, or click here to read the command line manual. Thank you for using ScrEnc!